A warm thank you from the Aodyo team for believing in us and supporting our work! We hope you will love using your Link as much as we do. Sylphyo Link is a compact sound bank for electronic wind instruments and other MIDI controllers. Aodyo Instruments constantly improves it and updates its sounds to offer musicians rich and expressive sonic worlds in a small and portable package. The Link is also the wireless receiver companion for your Sylphyo, the electronic wind instrument made by Aodyo. With a Link receiver, your Sylphyo turns into a wireless instrument, allowing you to plug it to an amp, a mixer, or a hi-fi system while you play a few meters away, without being bothered by wires. This means that instead of connecting the Sylphyo directly to your sound system, computer, or synthesizer, you can connect the Link receiver instead, and use your Sylphyo freely without being bothered with cables. The Link also has built-in MIDI routing capabilities, allowing you to transmit MIDI from your Sylphyo or any other controller to your computer or other MIDI and USB-MIDI synthesizers. When paired with a Sylphyo, this means that not only will you be able to transmit the sound of your instrument wirelessly, but also the MIDI performance data, allowing you to control several synths and virtual instruments at the same time. And nothing prevents you from using them both wired and wireless. For instance, you could use the headphones output of the Sylphyo as an in-ear monitor on stage while the Link is connected to the control booth and to various expanders and synths at the same time. A yellow light (pairing Link light) means the Link is looking to pair with any Sylphyo. A green light (paired Link light) means the Link is paired and connected with a Sylphyo. A red light (unpaired Link light) means the Link is paired with a Sylphyo but is not connected to it. Power-on switch. Turns the Link on and off. ▲ and ▼ buttons. When using the Link as a synthesizer without being connected to a Sylphyo, press the ▲ or the ▼ button to switch to the next or previous sound. Pressing ▲+▼ at the same time restarts the pairing process with a Sylphyo. Headphone output port (6.35mm stereo jack). Play the Link synth with headphones. Line input port (6.35mm stereo jack). Mix any sound source to your own sound. Line output ports (left and right 6.35mm mono jacks). Play the Link synth on an amp, a mixer, or a hi-fi system. MIDI ports (DIN). Connect a MIDI controller to play the Link as a synthesizer (MIDI in), or wirelessly control a hardware synth using your Sylphyo (MIDI out). USB host port (USB A). Connect a USB-MIDI controller to play the Link as a synthesizer, or use your Sylphyo to wirelessly control a synth that takes USB-MIDI input. USB power supply port (USB Mini-B). Provides power to your Link. Also allows you to use your Sylphyo as a wireless MIDI controller to control virtual instruments on your computer, smartphone or tablet, or to control them with a MIDI controller, using the Link as a MIDI-to-USB converter. Plug the 5W charger into a mains socket in order to power the Link using the USB cable. Use the USB cable to connect the Link to your computer or to a charger. You might also have bought a Sylphyo alongside your Link to play it wirelessly. You can use the charger and USB cable to charge your Sylphyo, or to directly connect it to a computer. For more information about the Sylphyo, please read the dedicated user guide. 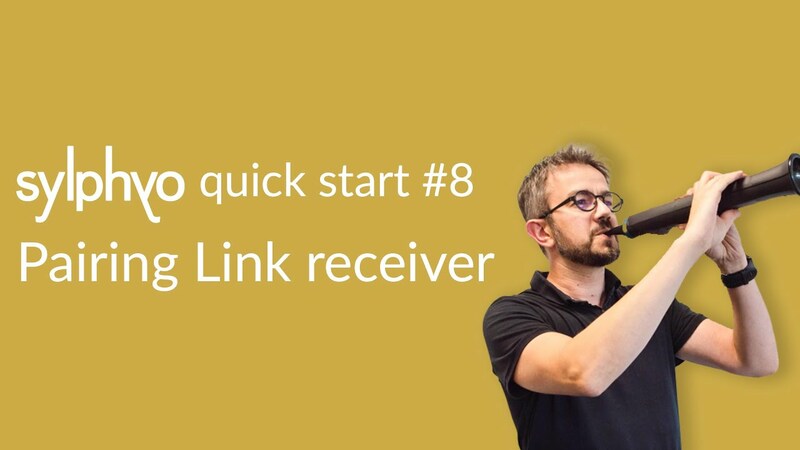 If you plan to use your Link with a Sylphyo, both must be paired; that is, they must learn to establish a wireless connection to each other. The pairing is done once, and they will remember their association afterwards and automatically recognize each other when they are both powered on and in the same room. Connect the Link to the mains using the included USB cable and charger. The cable must be connected to the smaller USB power supply port of the Link. Then, turn on your Link using the power-on switch, and turn on your Sylphyo as well. If the Link displays a green light (paired Link light), then they are already paired (i.e., they already know each other), and you can skip the rest of this subsection. Else, you will need to initiate pairing on both sides before being able to use your Sylphyo wirelessly. Each side will then look for a counterpart that is available, and once they have found each other they will remember their association. First, on the Link side, press both ▲ and ▼ at the same time to start the pairing process. The light will become yellow (pairing Link light) until the Link has found an available Sylphyo. Then, on your Sylphyo, go to the settings menu by holding the Aodyo key while swiping your thumb from the bottom to the top of the slider. 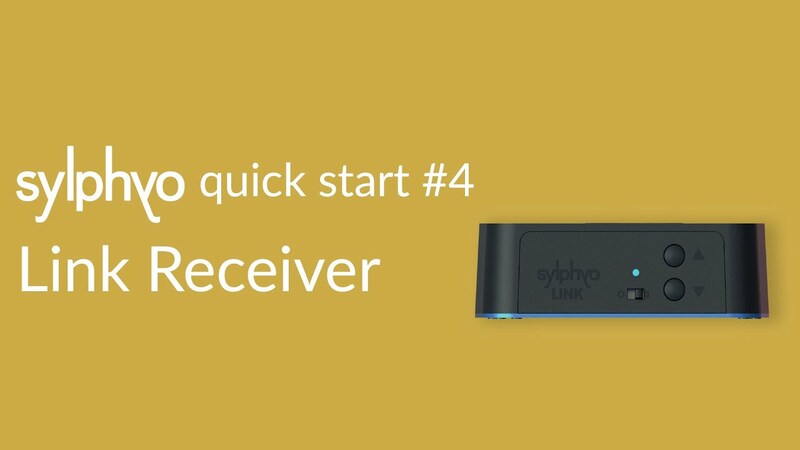 Make sure the Wireless (Link) item is checked, and select the Receiver device item just below to start the pairing process from the Sylphyo side. The icon of the menu item should become (pairing symbol) until the Sylphyo has found an available Link. A few moments after, you should see the light changing to green (paired Link light) on your Link, and the icon changing to (paired symbol) on your Sylphyo: your Sylphyo and Link are paired! 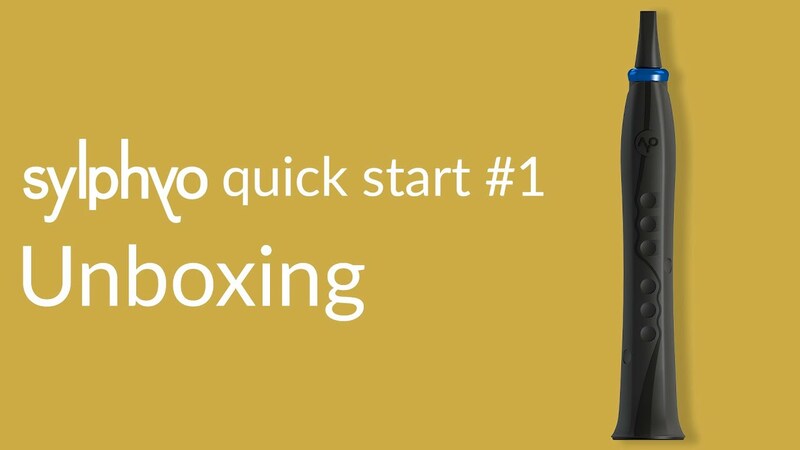 If not, just restart the pairing process again. From the moment your Sylphyo and Link are paired, they will constantly look for each other. If your Sylphyo doesn’t find your Link, it will display the (unpaired symbol) icon. If your Link doesn’t find your Sylphyo, it will display a red light (unpaired Link light). If you plan to use the Link with another MIDI controller, there are several options to connect it. If your controller has a 5-pin MIDI DIN port, connect a MIDI DIN cable (not included) from the MIDI OUT port of your controller to the MIDI IN port of your Link. If your controller works with USB-MIDI, connect a USB cable from your controller to the USB HOST port of your Link. In this section, you will learn how to use the Link with your controller, Sylphyo or otherwise, to play its internal sounds as well as other sounds on your computer, phone, tablet, or synthesizer. Connect the Link to a power supply. 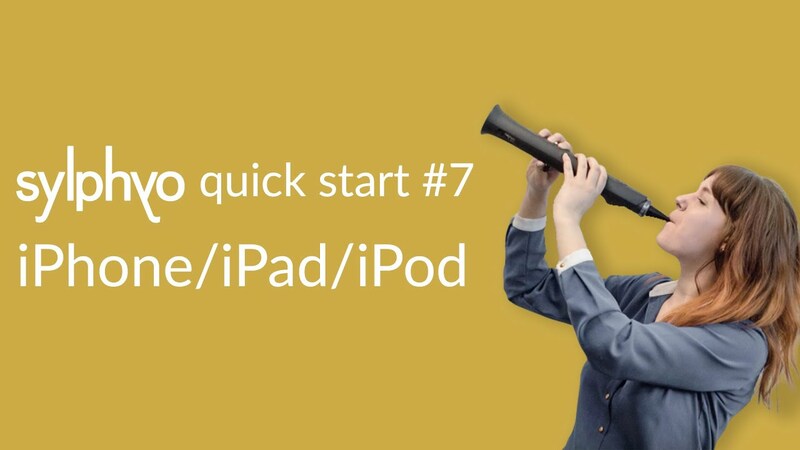 Then, connect it to an amp, a mixer, a hi-fi system, or any speakers or sound system, using either the headphone output port or the line output ports (the sound will be louder when using the headphone output port). Finally, turn on your Link and your controller, and play. Connect the included USB cable to the smaller USB power supply port of the Link, connect the other end to a USB port on your computer, and turn on your Link. No drivers are required, and it should be immediately recognized as a standard USB-MIDI peripheral. You can use Sylphyo Bench or any virtual instrument just like you would do when the Sylphyo or any other controller is connected directly. Just turn on your Sylphyo or other controller, and you can start playing. Sylphyo. This is the wireless MIDI input and output to your Sylphyo. MIDI DIN. This represents the two MIDI DIN ports on the rear panel of your Link, which you can use to communicate with other hardware. USB-MIDI Host. This represents the USB-MIDI device, if any, connected to the USB host port of your Link. Playing wirelessly with an iOS smartphone or tablet is no different from playing with a direct USB connection to the Sylphyo. You still need to get Apple’s official Lightning to USB 3 Camera Adapter. First, if you’re using a Sylphyo, turn it off if it is powered on. Connect the adapter to a power source, such as a USB charger or a portable power bank. Then, connect the powered adapter to the Lightning port of your iDevice, and connect your Link receiver to the powered adapter using the included USB cable. Now, turn on your Link, wait a few seconds, then turn on your Sylphyo or other controller. You should now be able to play on any music app that handles MIDI. You can control any MIDI-compatible hardware synthesizer with the Sylphyo+Link. 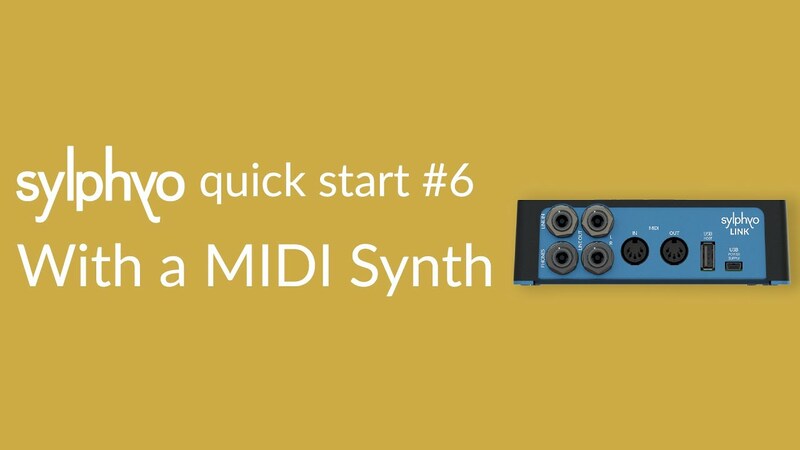 However, you will need to get a MIDI cable to connect your synthesizer to the Link. First, connect the Link to a power supply. Then, plug one end of the MIDI cable to the MIDI Out port of your Link, and plug the other end into the MIDI In port of your synth. Finally, turn on your Link and Sylphyo, as well as your synth. You should now be able to play, but note that synthesizers specialized in wind instruments simulations need to receive breath control data on MIDI CC2, in which case you will have to change the MIDI Mapping configuration of the Sylphyo in the MIDI Mappings section of the Settings menu. We have successfully used the following synthesizers with the Sylphyo: Dynasample XPression, Waldorf Blofeld, Korg Kronos, Arturia Origin, Mutable Instruments Elements and Shruthi1. Axoloti Core, Yamaha VL-70m, and Nord Modular G2. See also the great patches at www.patchmanmusic.com. Please take note of the following important information before you begin to use your Link. Do not open the Link and do not attempt to service it yourself. Damage to you or your instrument could occur during teardown. Please contact Aodyo or an authorized service provider. Avoid forcing a connector into a port, and do not use the switch with excessive force. If a connector does not fit into a port, first check that they match. The indicator light of the Link turns on at most two seconds after power-on. If you suspect that the Link does not turn on normally, make sure you have been waiting for at least ten seconds before trying to turn it off and on again. Your Link must be disposed of properly according to local laws and regulations. Because it contains electronic components, it must be disposed of separately from household waste. All the trademarks cited in this documentation are only used here for descriptive purposes. They remain subject to legal regulations and are owned by their respective property holders. This documentation represents the current state of the product, however it may evolve. We do everything we can to provide our users with high-quality products and documentation. 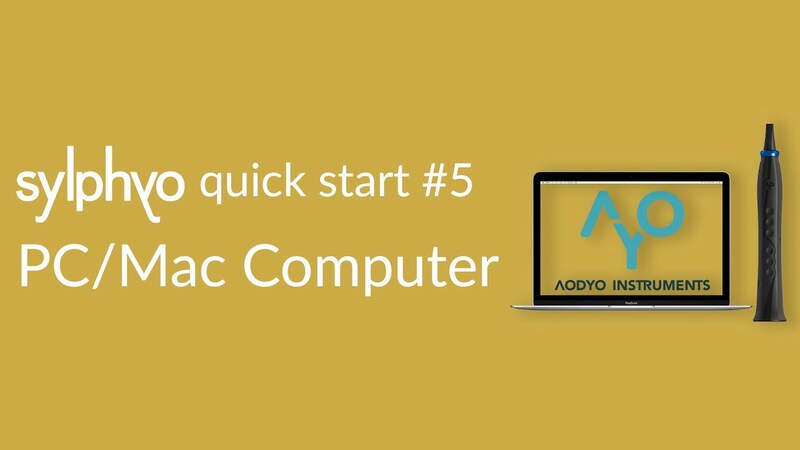 However, Aodyo does not guarantee that this documentation exactly reflects the state of the product. Aodyo is not liable for data loss or damage resulting from the use of this product and/or its documentation.